"Thank you for your love and support. May you always experience the joy that comes from putting Christ at the center of your lives." "Sacred Scripture is not something for the past. The Lord does not speak in the past but speaks in the present, he speaks to us today, he enlightens us, he shows us the way through life, he gives us communion, and thus he prepares us and opens us to peace." 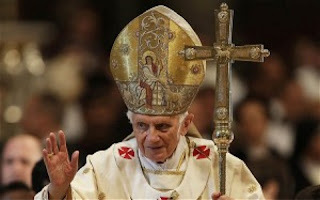 May God continue to bless Pope Benedict XVI during his retirement! "Study this Catechism! This is my heartfelt desire. Study this Catechism with passion and perseverance. Study it in the quiet of your room; read it with a friend; form study groups and networks; share with each other on the Internet...You need to be more deeply rooted in the faith than the generation of your parents..."
"It is only the rock of total, irrevocable love between a man and a woman that can serve as the foundation on which to build a society that will become a home for all mankind"
Each day this week, leading up to the Holy Father's abdication on Thursday, I will post a favorite quote or extended comment from Pope Benedict. "Faith is a living reality that must constantly be discovered and deepened so that it may grow." "Be content, brethren, to follow my example, and mark well those who live by the pattern we have given them; I have told you often, and now tell you again with tears, that there are many whose lives make them the enemies of Christ’s cross. Perdition is the end that awaits them, their own hungry bellies are the god they worship, their own shameful doings are their pride; their minds are set on the things of earth; whereas we find our true home in heaven. It is to heaven that we look expectantly for the coming of our Lord Jesus Christ to save us; he will form this humbled body of ours anew, moulding it into the image of his glorified body, so effective is his power to make all things obey him. Then, O my brethren, so greatly loved and longed for, all my delight and prize, stand firmly in the Lord, beloved, as I bid you." Philippians 3:16 The words ‘all be of the same mind’ do not appear in the best Greek manuscripts. "Join with others in being imitators of me, brothers, and observe those who thus conduct themselves according to the model you have in us. For many, as I have often told you and now tell you even in tears, conduct themselves as enemies of the cross of Christ. Their end is destruction. Their God is their stomach; their glory is in their “shame.” Their minds are occupied with earthly things. But our citizenship is in heaven, and from it we also await a savior, the Lord Jesus Christ. He will change our lowly body to conform with his glorified body by the power that enables him also to bring all things into subjection to himself. Therefore, my brothers, whom I love and long for, my joy and crown, in this way stand firm in the Lord." * [3:17–21] Paul and those who live a life centered in Christ, envisaging both his suffering and resurrection, provide a model that is the opposite of opponents who reject Christ’s cross (cf. 1 Cor 1:23). * [3:17] Being imitators of me: not arrogance, but humble simplicity, since all his converts know that Paul is wholly dedicated to imitating Christ (1 Cor 11:1; cf. also Phil 4:9; 1 Thes 1:6; 2 Thes 3:7, 9; 1 Cor 4:6). * [3:20] Citizenship: Christians constitute a colony of heaven, as Philippi was a colonia of Rome (Acts 16:12). The hope Paul expresses involves the final coming of Christ, not a status already attained, such as the opponents claim. From which continent will the next Pope come from? The RSV-CE vs. RSV-2CE series of posts come up from time to time when I notice something changed in the second edition from the original. The changes that interest me are not so much the ones concerned with the removal of archaic language, but substantial alteration, like the change from "powers of death" to "hades" in Matthew 16:18. Since Ignatius Press hasn't provided a list of these changes, I hope you find these posts helpful. By the way, while on this occasion I noticed the difference while I was reading from the RSV-2CE, there is a source for looking up the changes and that is Emmaus Road's Catholic Bible Concordance RSV-CE. If you use the RSV-CE or RSV-2CE you really need to own this concordance. This new change I noticed when I was reading through the Pauline Epistles. I found that the RSV-2CE translated the Greek word anthropos more literally as "man" and not as "nature" as found in the original RSV. If you compare how this term is translated in most other translations, you will see that even literal ones, like the NASB, go with either "self" or "nature." The Douay-Rheims and KJV went with "man" while Msgr. Knox rendered anthropos with "self." If you are looking for an introductory Bible study on James, particularly if you are home bound, this might be just what you are looking for. It is facilitated by Deacon Alex Jones from my home Archdiocese of Detroit. Deacon Alex Jones grew up as a devout Pentecostal, became a devoted Pentecostal minister, and later converted to the Catholic Church. Today he is a Catholic deacon who speaks at many conferences each year around the country. You can purchase the DVD series, along with study guide for under $40. There are a total of 13 lessons, each just under thirty minutes in length. For more information about this series, you can go here. Congrats to David on being the winner of the B16 contest. Just send me an email with your address and I will get your prize out to you early this week! From Mass on Ash Wednesday. This long ovation was only ended by our Holy Father, himself, who wanted the faithful gathered at St. Peter's to return back to a spirit of prayer. In many ways this encapsulates the entire career of Benedict XVI. For him, as it should be for all of us, it is all about the Lord Jesus! 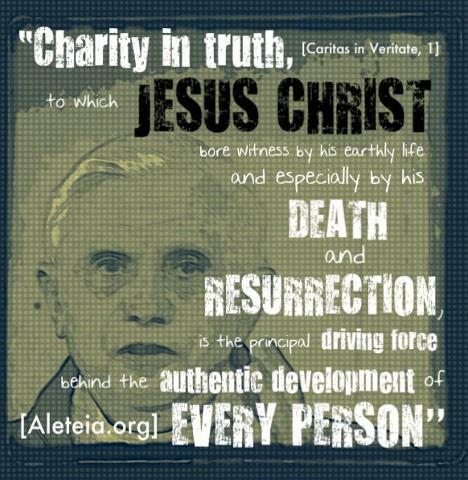 Pope Benedict knows this with every fiber of his being, and has been trying to communicate this fundamental truth to us, both in his writings and actions. He will be missed! 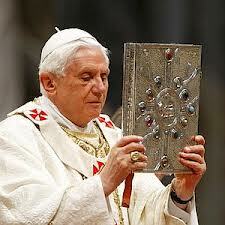 May our Heavenly Father richly bless Pope Benedict XVI! In honor of the news that our beloved Holy Father Pope Benedict XVI will be retiring at the end of the month, I would like to offer a contest. The winner of this contest will receive a small prize pack that will include copies of Deus Caritas Est, Spe Salvi, and St. Paul: Spiritual Thoughts Series by the USCCB publishing. As a bonus, particularly since Pope Benedict is a top rate Biblical scholar, I will include a fascinating 4CD set called Understanding the Dead Sea Scrolls presented by Dr. Michael Barber. This prize pack contains not only great resources for Lent, but also for the remainder of the Year of Faith! 2) This contest is open to everyone, not just those in North America. 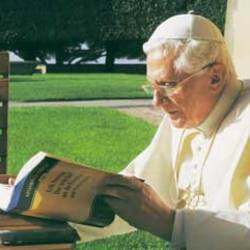 3) Answer the following question in fifty words or less, in the comments: "What will you miss most about Pope Benedict when he abdicates on February 28th?" 4) Include at least your first name and country at the end of the entry. No anonymous entries will be considered. Only one entry per person. 5) Contest ends on Saturday, February 16th at 11:59PM. You can view some sample pages here. 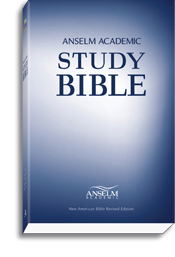 Organized and developed with today’s reader in mind, the Anselm Academic Study Bible is an unsurpassed resource for anyone who wants to know more about the Bible. No previous knowledge of the Bible is assumed here, and newcomers and veterans alike will benefit from the Study Bible’s insightful articles, sensible structure, and user-tested design. -Rigorous scholarship. Academic articles and introductions accompanying the biblical books are based on the latest research. Contributors include both established and emerging Scripture scholars. - Rich study aids. Charts, maps, timelines, and reference to online resources enhance learning. Full color and black-and-white photographs of places and objects commonly mentioned in the Bible convey a strong sense of the life and times of the biblical world. - Distinctive approach.The Study Bible addresses diverse students, practices sound pedagogy, and encourages critical thinking. Topics include those on cultural, ethnic, social, gender, and political issues and speak to today’s reader, explaining the context of the Bible’s writing. -Navigation-friendly organization. Two academic introductions-Anselm and NABRE-preface each of the biblical books; other resources sensibly and accessibly arranged. Peerless in design, the Anselm Academic Study Bible is appropriate for anyone approaching the Bible from an academic perspective and who wishes to deepen their understanding of this most influential book. All sadness or shock on my part is, of course, a selfish reaction to this morning's news. God bless our Holy Father, Pope Benedict XVI! "Here, brethren, is an account of the gospel I preached to you. It was this that was handed on to you; upon this your faith rests; through this (if you keep in mind the tenor of its preaching) you are in the way of salvation; unless indeed your belief was ill founded. The chief message I handed on to you, as it was handed on to me, was that Christ, as the scriptures had foretold, died for our sins; that he was buried, and then, as the scriptures had foretold, rose again on the third day. That he was seen by Cephas, then by the eleven apostles, and afterwards by more than five hundred of the brethren at once, most of whom are alive at this day, though some have gone to their rest. Then he was seen by James, then by all the apostles; and last of all, I too saw him, like the last child, that comes to birth unexpectedly. Of all the apostles, I am the least; nay, I am not fit to be called an apostle, since there was a time when I persecuted the church of God; only, by God’s grace, I am what I am, and the grace he has shewn me has not been without fruit; I have worked harder than all of them, or rather, it was not I, but the grace of God working with me. That is our preaching, mine or theirs as you will; that is the faith which has come to you." I Corinthians 15:2 ‘Unless indeed your belief was ill founded’; some commentators take this as meaning ‘Unless your belief has been ineffectual’, i.e. 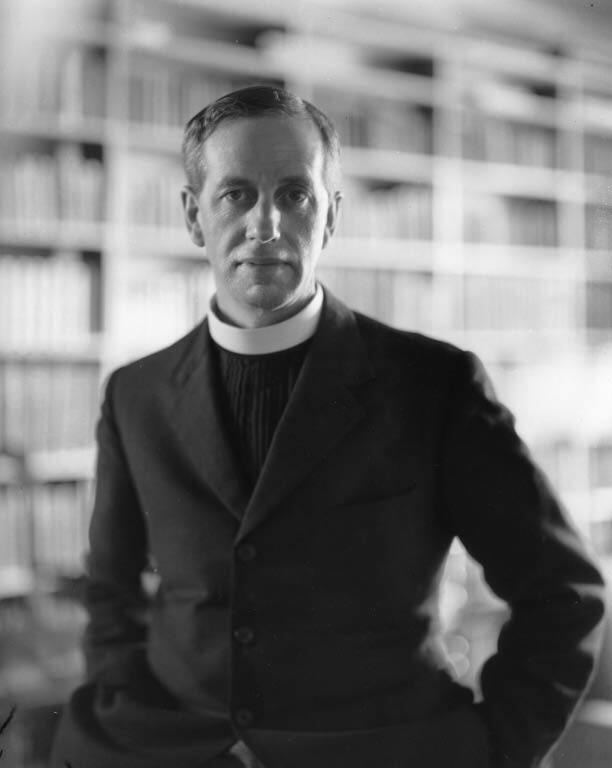 ‘has not succeeded in forming a true Christian character’. I Corinthians 15:8 St Paul compares himself to a child born prematurely; hence it is difficult to see how there can be any allusion to the comparative lateness of our Lord’s appearance to him. He seems to be thinking rather of the sudden, catastrophic manner in which grace came to him. Others think that he compares himself out of humility, to a child born physically weak. that Christ died for our sins in accordance with the Scriptures; that he was buried; that he was raised on the third day in accordance with the Scriptures; that he appeared to Cephas, then to the Twelve. After that, Christ appeared to more than five hundred brothers at once, most of whom are still living, though some have fallen asleep. After that he appeared to James, then to all the apostles. Last of all, as to one born abnormally, he appeared to me. For I am the least of the apostles, not fit to be called an apostle, because I persecuted the church of God. But by the grace of God I am what I am, and his grace to me has not been ineffective. Indeed, I have toiled harder than all of them; not I, however, but the grace of God that is with me. Therefore, whether it be I or they, so we preach and so you believed." * [15:1–11] Paul recalls the tradition (1 Cor 15:3–7), which he can presuppose as common ground and which provides a starting point for his argument. This is the fundamental content of all Christian preaching and belief (1 Cor 15:1–2, 11). * [15:3–7] The language by which Paul expresses the essence of the “gospel” (1 Cor 15:1) is not his own but is drawn from older credal formulas. This credo highlights Jesus’ death for our sins (confirmed by his burial) and Jesus’ resurrection (confirmed by his appearances) and presents both of them as fulfillment of prophecy. In accordance with the scriptures: conformity of Jesus’ passion with the scriptures is asserted in Mt 16:1; Lk 24:25–27, 32, 44–46. Application of some Old Testament texts (Ps 2:7; 16:8–11) to his resurrection is illustrated by Acts 2:27–31; 13:29–39; and Is 52:13–53:12 and Hos 6:2 may also have been envisaged. * [15:9–11] A persecutor may have appeared disqualified (ouk…hikanos) from apostleship, but in fact God’s grace has qualified him. Cf. the remarks in 2 Corinthians about his qualifications (2 Cor 2:16; 3:5) and his greater labors (2 Cor 11:23). These verses are parenthetical, but a nerve has been touched (the references to his abnormal birth and his activity as a persecutor may echo taunts from Paul’s opponents), and he is instinctively moved to self-defense. First off, I would like to thank reader Michael D. for alerting me to this article at First Things. It is entitled "A Bible That Keeps Us Apart" and is written by Eleanor Everett Pettus. It comes in a long line of articles that have appeared either in the print edition of First Things or its online forum. Most notable, of course, were the articles penned by the late Fr. Richard John Neuhaus, where he complained bitterly about having to read from the NAB at Mass. So what is new with the latest article from Eleanor Pettus? Not too much really, except this time her main argument is that the NAB actually hinders Protestant conversions to the Church. "Many Protestants believe, rightly or wrongly, that Catholics do not respect Scripture—they don’t want to revel in the God’s Word and get to know Him intimately through this great gift. The NAB is a confirmation to Protestants that they are right—Catholics, or at least the Catholic bishops, really don’t care. If they did, how could these leaders deny their people the liturgical use of a good translation?" 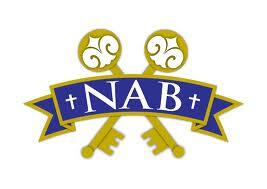 "The NAB is not just a problem for Catholics. If the Catholics are serious about wanting Protestants to 'Come Home' they need to give them a translation they can respect." Having done ecumenical Bible studies for over ten years I have never heard any Protestant even mention that this was an issue. In my experiences, the vast majority of Protestants I know use some version of the NIV, not the "KJV, RSV, NASB, NKJV, ESV" that she recalls from her experiences in college. Just take a look at the most recent CBA sales ranking of Bible translations and you will see that the NIV remains ever popular, even though its most recent revision was panned by some in the Evangelical community. Consider how many people purchase and use a translation like Peterson's The Message, which is a true paraphrase. Other translations, like the NIV and NLT, which are more dynamic than the NAB(RE) in their translation style continue to be sold, not to mention the almost continuous publication of new translations in the Protestant community. So, personally, I do not buy this argument at all. If she means a certain segment of the Evangelical population won't accept the NAB then that is possible, but certainly not all or most Protestants. "Truly, then, to a Protestant who has been raised to love and treasure the language of the word, the New American Bible or “NAB” used in most Catholic parishes is a scandal. To the Christian who knows little of sacraments and much of Scripture, a good translation provides their clearest window into the divine mystery. Yet the NAB’s terrible translations are in particular relief when Protestant strangers are most likely to be visiting. On Christmas we are forced to hear “Wonder-Counselor, God-Hero, Father-Forever, Prince of Peace”—in place of a verse which every English-speaking Christian knows because we’ve heard Handel. What editor thought it would be good to render those beautiful words in that way? One does not have to make an idol of Scripture to regard an unreadable translation as dishonorable." Ouch! Of course, if you read the rest of the article, and most of the reader comments, very few other examples from the NAB are brought up. Nothing like referring to a translations as "terrible" yet only referencing one example. Now to be sure, the NAB, or the much improved NABRE, is not likely to win any literary awards anytime soon. Yet, it is still a very good translation overall, which I have tried to demonstrate on this blog from time to time. There are indeed places where I prefer renderings from a slightly more formal translation like the RSV, but having spent some time comparing the two over the past couple of years, including teaching both high school and adult learners, I believe that the main complaints against the NAB are greatly exaggerated. So, for example, while I think the RSV does a better job, overall, with a book like Genesis, I would prefer to use the NABRE when teaching from the Gospel of John. The NAB's renderings of John 1:18, the "Amen, Amen" sayings, and the all important "I AM" sayings makes it far better to teach from than the RSV since the Christological connections are handled better. So, in the end, I am very comfortable recommending the NABRE, as well as the RSV-2CE, to pretty much anyone who wants to study the Bible. My advice is to own and use both for study, pick one as your daily reading Bible, and just stop the never-ending complaining. The NAB, in whatever form it takes during this next decade of revision, is not going away anytime soon. When completed, I believe it will be even better than the improved NABRE. Yet, no doubt there will continue to be its detractors. While there certainly has been enmity between those who like the NAB and those who don't since 1971, I think this continued assault on the NAB is actually harmful to the Church in America. The insinuation by the NAB haters always seems to be that the Bishops are either biblically unsophisticated or either greedy being only interested in gaining royalties from sales of the NAB. In either case, this kind of thinking promotes division during a time in our nation's history where we need to be supportive of our Shepherds. I pray that we do not find ourselves engaged in the same type of public disputes concerning translations that are found in some segments of the Evangelical community. While it is already present, to some extent, in the Catholic Church in America, I would hate to see the same kind of characterizations that occur in the Evangelical community, where the type of Evangelical one is (good/bad, liberal/conservative) being tied to the Bible translation they might read, whether the KJV, NASB, ESV, or NIV. Although I am afraid that we already see this, perhaps not as publicly though. Am I saying that we shouldn't critique the NAB? By no means! (Or perhaps I should render that: "Of course not!") Rather, let us be glad that there are numerous good translations out there, including the NRSV, JB, NJB, CCB, NCB, Knox, and even the Douay-Rheims, for people to choose from. In discussing the revision of the NAB last summer, Cardinal Wuerl stated: "The goal — it’s a very simple goal — the goal is to produce a single translation, to arrive at a single translation." Ultimately, that translation is going to be the New American Bible. 1) Has Eleanor Pettus actually read significant portions of the new NABRE? 2) Does she know about the revision that will be taking place over the next decade? 3) What kind of Protestant is she referring to? 4) Why does there continue to be such venom out there for this translation? 5) This whole issue reminds me of a post I did a year ago concerning those who have labeled the NAB(RE) as a paraphrase. Utter nonsense. 6) I am surprised she didn't mention the NAB notes! Today is the last day of the introductory pricing at Logos. You can get up to 15% off many packages. So, if you are interested in getting started with this fantastic Catholic Bible software, today is the day. I Corinthians 12:31 Charity is itself a gift, and, if it is contrasted with other spiritual gifts, overshadows them all. I Corinthians 13:2 Cf. Mt. 21.21. I Corinthians 13:3 Some Greek manuscripts have ‘in order to boast of it’ instead of ‘to be burnt at the stake’. I Corinthians 13:5 ‘Never insolent’; the Latin word used here means ‘ambitious’, but the Greek original has rather the sense of ‘indecorous’. I Corinthians 13:13 St Irenaeus and Tertullian, followed by some modern authors, understand this as meaning that all three theological virtues will persist in heaven; but this interpretation would be irrelevant to the present context. "Strive eagerly for the greatest spiritual gifts. * [13:1–13] This chapter involves a shift of perspective and a new point. All or part of the material may once have been an independent piece in the style of Hellenistic eulogies of virtues, but it is now integrated, by editing, into the context of 1 Cor 12–14 (cf. the reference to tongues and prophecy) and into the letter as a whole (cf. the references to knowledge and to behavior). The function of 1 Cor 13 within the discussion of spiritual gifts is to relativize all the charisms by contrasting them with the more basic, pervasive, and enduring value that gives them their purpose and their effectiveness. The rhetoric of this chapter is striking. * [13:1–3] An inventory of gifts, arranged in careful gradation: neither tongues (on the lowest rung), nor prophecy, knowledge, or faith, nor even self-sacrifice has value unless informed by love. * [13:4–7] This paragraph is developed by personification and enumeration, defining love by what it does or does not do. The Greek contains fifteen verbs; it is natural to translate many of them by adjectives in English. * [13:8–13] The final paragraph announces its topic, Love never fails (1 Cor 13:8), then develops the permanence of love in contrast to the charisms (1 Cor 13:9–12), and finally asserts love’s superiority even over the other “theological virtues” (1 Cor 13:13). Archbishop of Brisbane and Chairman of the Australian Catholic Bishops Commission on the Liturgy, Mark , formally launched the international edition of The New Community Bible (NCB) in Sydney on the feast day of Blessed James Alberione, the founder of the Pauline Family. 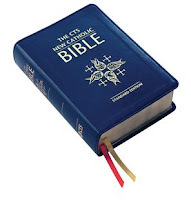 The NCB published by St Pauls Publications is a revised edition of the popular Christian Community Bible translated by Late Bernardo Hurault, a French Priest, from original languages to Spanish in 1971. Since then it has been translated into many languages and millions of copies have been distributed with its unique feature of a pastoral commentary that accompanied the text which has helped the faithful to understand, assimilate and live the word of God in their day to day life. The Preface and the Presentation of the NCB states that it is the fruit of a challenging project undertaken by the Society of St Paul who brought together a competent team of Bible scholars who worked hard over a decade and undertook the responsible task of “completely re-writing the introduction and the commentary of each book of the Bible based on sound exegesis and relevant pastoral application” and has done a ‘careful revision of the text’ wherever it was required. Another unique feature of the NCB mentioned is “its many references to the deep spiritual message and biblical values found in the scriptures of other great world religions”. The international edition of the NCB is published for special promotion in the Year of Faith by St Pauls based in Sydney, London and New York. It is a great resource for all those who wish to have a deeper understanding of the scriptures and a great help for all those who make use of Scripture in daily prayer, in Bible study groups and in small communities. ** You can also read a review of the NCB at the Raking through the Ashes of Christendom. ** I do not think this translation has anything to do with the Lectionary revision of the ESV, that Bishop Coleridge is currently involved in. Perhaps some of our friends in Australian can comment on the NCB. You can check out a few renderings of the NCB here. 1 The LORD is my shepherd, what more do I need? 2 In green pastures he lets me rest. 3 and revives my failing spirit. ever true to his name. no harm would I fear, for you are there by my side. With your rod and your staff you give me comfort.